Made out of fine metals for superior tone production, the Etude EAS-100 is the perfect instrument for starting out on the alto saxophone. The keywork, pads, and adjustment all work together to make tone production easier, more consistent, and stronger. And the bell brace and construction help make it as durable as possible. Includes case, mouthpiece, cap, and ligature. 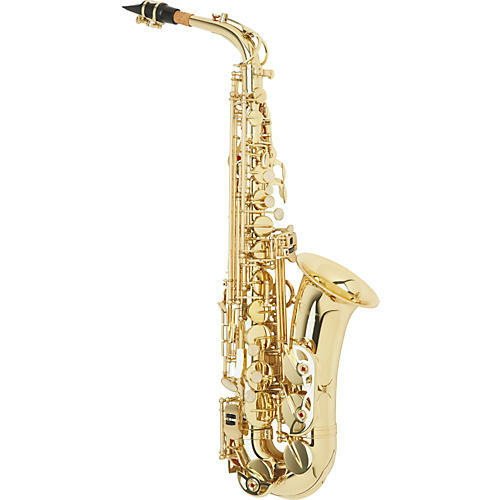 It may be tempting to buy a "better" horn used, but saxophones are mechanically complex, and if the horn is not well regulated and set up properly, it will be extremely difficult for a student to play. It is perhaps advisable then for a new student to get an Etude EAS-100, brand new, set up perfectly, and ready to play right out of the case. It will be shiny and beautiful, and your young saxophonist will jump up and down and squeal when he or she sees it. Pride of ownership inspires practice, and practice leads to success. Etude believes believe that price should not be a barrier to experiencing the growth and joy that comes from making music. That's why Etude offers you five of the most popular woodwind and brass instruments at an incredible price: flute, clarinet, alto sax, trumpet, and trombone. And no matter which you choose, you get a great design and outstanding construction that will give you years of musical enjoyment. See for yourself.